This is such fabulous oil in my Eight Body Moisture. Monoi Oil offers a bonus to all because it is a combination of two oils. Monoi Oil is made from the Tiare Flower (Gardenia taitensis), Tahiti’s national flower and refined Coconut Oil. 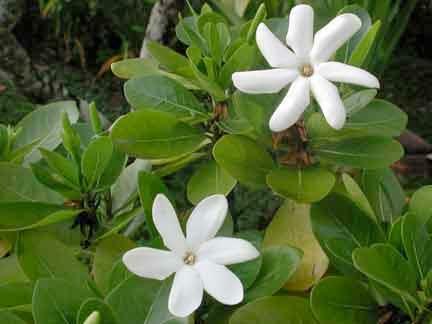 The Tiara Flower is a small white, star-shaped flower found throughout French Polynesia. These flowers are hand-picked at a very particular stage of their growth, specifically when they are still unopened, for maximum fragrance and benefit. The flowers are used immediately and placed in refined coconut oil for a minimum of 15 days. This is known as “enfleurage” (flower soaking), a French term used to designate a specific extraction step. The Coconut Oil for Monoi Oil comes from the Coconut palm tree in the Polynesian Islands. The process of refining the Coconut Oil is so complicated, yet so interesting. I will try not to bore you with the specifics but it is just so much fun to understand how these extraordinary oils are developed. Coconuts fall from the trees, gathered and cracked with an ax, allowed to dry in the sun until the coconut almonds (or meat) have shrunk enough to be removed from the shell and broken into small pieces, coconut almonds are placed on wooden barracks and covered with sliding metal roofs, known as “coprah dryers”, coconut meat looses over 90% of its moisture, placed in natural fiber bags, shipped to a unique oil mill located on the island of Tahiti, placed in special machines and ground to a fine coco flour, heated and finally pressed into raw coconut oil, oil is further refined to reduce any impurities and balanced with Vitamin E.
Thanks for indulging me, but let’s get to the important part…what Monoi Oil does for the body. Another great partnership for Eight Body Moisture!